Written by Admin on November 30, 2018 . Posted in News. 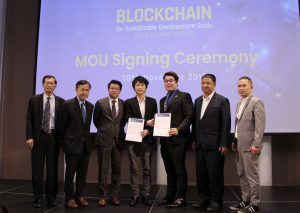 The Confederation of Asean Journalists (CAJ) has joined with Bitkub Capital Group Holding Co., Ltd., the chairman of Thailand’s blockchain network, the National Innovation Agency (Public Organization), European Blockchain Hub and an international non-profit organization, to host the first ever International Blockchain Summit, “Blockchain for Sustainable Development Goals Tour Summit 2018/19” in Bangkok on November 30, 2018. 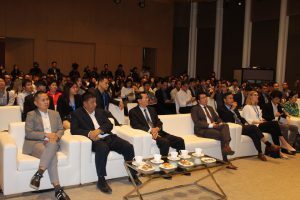 Mr. Jirayut Srupsrisopa, Chief Executive Officer of Bitkub Capital Group Holding Co., Ltd. (BCGH), said this event was organized by the European Blockchain Hub and is aimed at stimulating exchanges of knowledge and ideas as well as adaptation of blockchain technology among the more than 20 countries in its network from Europe and other regions around the world, from the public and private sectors alike. They are England, Luxembourg, Spain, Poland, Germany, Austria, Sweden and Slovenia from Europe. Others include Indonesia, Hong Kong, Japan, Taiwan, Malaysia, Singapore, the Philippines, Vietnam, South Korea and India. “Thailand has been certified and officially granted membership with BCGH as the chairman of the Thailand network.” Mr. Jirayut said. In addition to get updates on the latest blockchain knowledge from European countries and Asean member nations, leaders from both the public and private sectors in Thailand have learned from case studies of companies in various industries that have successfully adapted blockchain technology. As well as strengthening their capability to deal with this dynamic business challenge approaching Thailand, the seminar helped participants learn how to exploit the potential of blockchain to apply in their business to reduce cost, optimize transparency and build collaboration internally and externally of the business kingdom. 1. 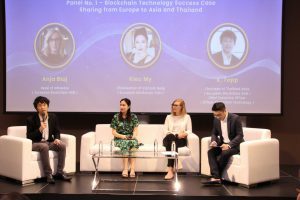 Blockchain Technology Success Cases, Shared from Europe to Asia and Thailand: Successes and adaptations of blockchain technology in Europe, Asia and Thailand that have improved administrative management in the public and private sectors, enabling them to effectively handle the blockchain technological revolution in different industries, be it banking and finance, logistics, trade or human resources. Anja Blaj, a delegate from the European Blockchain Hub, notes examples of European and Asian organizations that have started to use blockchain technology to support the UN Sustainable Development Goals in 2019. Mr. Rex Yeap, a founding member of European Blockchain Hub, presents the advantages of linking blockchain to national economic development in European countries. In addition, Dr. Phoom Phoomirat, cybersecurity consultant from the National Innovation Bureau, will discuss the impact on financial technology (fintech) and cybersecurity. Moreover, blockchain also has impact on the media. Mr. Jirayut Srupsrisopa, the CEO of BCGH, contributes his observations on how blockchain affects the media, the advertising industry and public awareness. Confirmation of authentication and origin of valuable objects, for instance important documents, identity documents, valuable belongings, pharmaceutical products and cosmetics by Mr. Amnaj Boonkwan, Sales and Marketing Director of Thai-British Security Printing Pcl. Khun Amnaj shares his knowledge on the socio-economic value that arises when it is possible to certify the identity of people, documents and merchandise by using blockchain technology. Exchange insightful information on blockchain technological adaptations from Europe to Thailand with case studies from European countries and how to adapt the technology to administrative management in the Thai government. Open up to the world of blockchain in the trade finance, intellectual property and tracing origination of products. Featured speakers are Dr. Somnuek Keretoh, a Commerce Ministry Consultant and Director of the Innovative Information Technology Institute at Kasetsart University; and Ms. Daovipa Leekumjohn, Director of the New Economy Group in the Policy and Trade Strategy Bureau at the Commerce Ministry. Their contributions will help Thai entrepreneurs learn how to prepare to cope with international trade wars. Learn for the first time about the usage of blockchain technology in large educational organizations from Mr. Phokai Srirattanopas, Assistant President of Chulalongkorn University, and Mr. Siriwat Kasemwattanaroj, Advance Visionary Architect from the Technology Group of Kasikornbank Pcl. Their presentations look at the practicality of blockchain technology in education, aiming to drive major progress in the public and business sectors today and in the future.